Find a little romance in your February as we explore the late 15th century “The Unicorn in Captivity” tapestry. We will recreate the fantasy, grace, and delicacy of the famed textile using watercolors. Join us, relax, and get creative among friends! “Women Create” is an ongoing series exclusively for women age 16 and over. The class features a new art project, muse, and discussion each month. All skill levels are welcome, and all supplies are provided. The cost of the class is $35.00 per person. Pre-registration is required and online registration is preferred. Click here to register online. 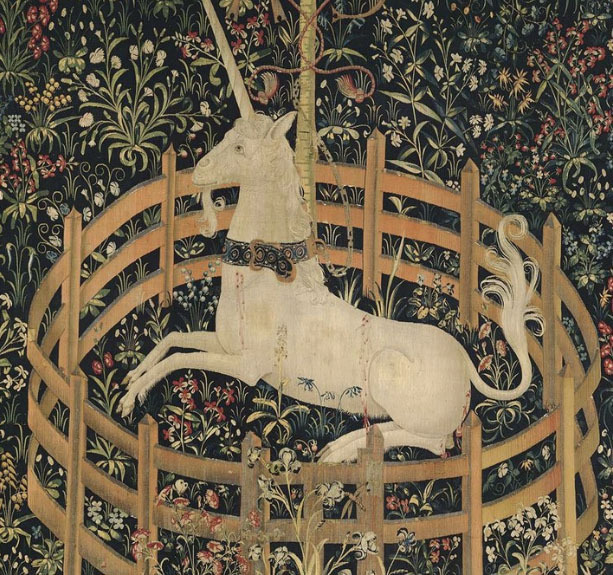 About Our February Muse: The seven individual hangings known as “The Unicorn Tapestries,” now in the collection of The Metropolitan Museum of Art in New York, are among the most beautiful and complex works of art from the late Middle Ages that survive. Luxuriously woven in fine wool and silk with silver and gilded threads, the tapestries vividly depict scenes associated with a hunt for the elusive, magical unicorn. “The Unicorn in Captivity” may have been created as a single image rather than part of a series. In this instance, the unicorn probably represents the beloved tamed. His confinement is a happy one, to which the ripe, seed-laden pomegranates in the tree, wild orchid, bistort, and thistle—medieval symbols of fertility and marriage—testify. About Our Teaching Artist: Mary-Gail King is an award-winning artist and self-proclaimed “Creative Catalyst.” As a Contemporary Impressionist she has a traditional Impressionist’s approach to paint and focuses on creating luminous color while capturing the essence of her subject. As a Creative Catalyst she helps people recognize and unleash their own creative powers. King is also an artist-in-residence at Studio Channel Islands in Camarillo.